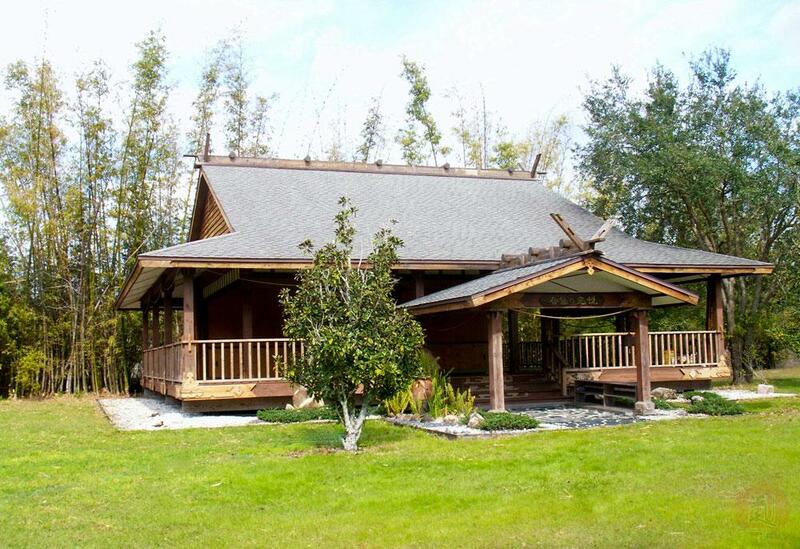 The Aiki Shrine is located in Myakka City in Southwest Florida. It was designed and built by Saotome Sensei as a place where advanced students could study O-Sensei’s vision of Aikido. The Aiki Shrine was built to recreate and preserve the deep sense of spirituality and connectedness to nature that he recalled of the original Iwama Shrine from his years serving and living with O-Sensei as uchi-deshi. In 2016, Saotome Sensei transferred ownership of the Aiki Shrine to the ASU to preserve as a lasting and physical legacy, and to unify future generations of ASU students and instructors through a living heritage and lineage to the spirit of O-Sensei. The Aiki Shrine offers unique training events throughout the year, open to ASU yudansha. Being invited to a special session at the Aiki Shrine is an honor, and allows students an opportunity to practice in this special setting. Since each session is small (approximately 20 people), it is an intimate environment, allowing for one on one interaction with Saotome Sensei and other visiting teachers. It also creates an opportunity to meet and create long-lasting relationships with your peers from ASU community around the country. Continuing and growing the legacy of the Aiki Shrine is a significant and ongoing challenge. The ASU is announcing an evergreen capital campaign to support the maintenance of the Aiki Shrine, and to create a sustainable foundation to support special facets of the ongoing mission of the ASU. The ASU has been established as a 501(c)(3) charitable organization, and has established the Craig Eddy Foundation as the repository for all charitable contributions. All donations to ASU and the Foundation can be tax deductible. Your contributions declare your commitment as a member and supporter of the Aikido Schools of Ueshiba. Please consider making a contribution to the future of ASU and Aikido, and the shared vision of O Sensei and Saotome Sensei for bringing harmony to the world. Add an amount to your annual ASU membership dues; talk to your Dojo Cho to make sure your contribution is noted.